Includes: A cart (Art.No. 50-00092) is always included with purchase of a complete ODEN system. 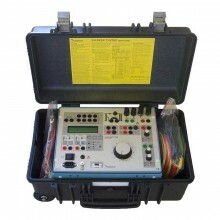 The cable set(s) for connection to the object under test must however be stated as a separate item in the order. 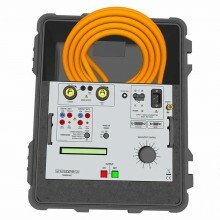 High current cable(s) for connecting current units in series is included with purchase of two or three current units. 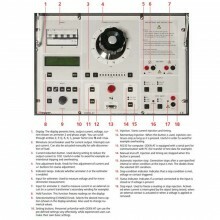 The system consists of a control unit together with one, two or three current units. There are three versions of the current unit: S, X and H. The S and X current units are identical except that the X unit has an additional 30/60 V output. 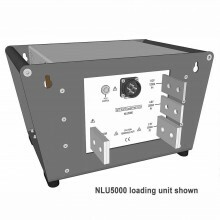 The H unit is rated for even higher current. 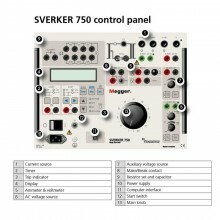 This makes it possible to configure an ODEN AT system in a suitable way. All parts are portable, and ODEN AT can be quickly assembled and connected. Example: ODEN AT/2X - 2 = Number of current units, X = Version of current unit (S, X or H). 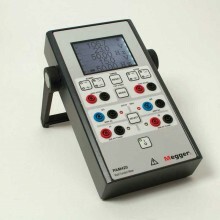 The control unit has many advanced features – a powerful measurement section for example, that can display turns ratio as well as time, voltage and current. 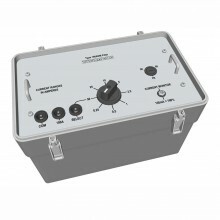 A second measurement channel can be used to measure an additional current or voltage. Current transformer turns ratio, impedance, resistance, power, power factor (cos φ) and phase angle are calculated and shown in the display. Current and voltage can be presented as percentages of nominal value. 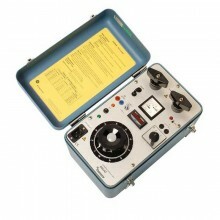 These tests require high currents and the ability to measure very short duration, current flow. ODEN AT has been designed especially to meet these needs. 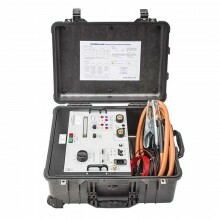 No extra contacts are needed to measure the operating time of a low-voltage breaker. Testing stops at the instant when the main breaker contacts open to interrupt the current. 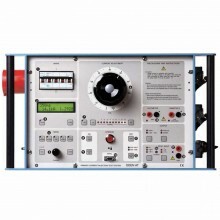 Output current initiation is synchronised with the currents zero-crossover point to ensure good repeatability and minimised DC offset. For turns ratio testing, the primary current and either the secondary current or the turns ratio are displayed simultaneously. 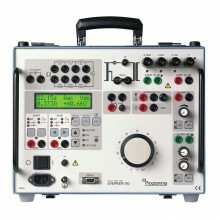 Since the turns ratio is displayed directly as the nominal value (1000/5 for example), no further calculation is needed. Burden of secondary circuits can be measured and presented in VA. The currents phase displacement is shown, and the polarities of the outputs are clearly marked. 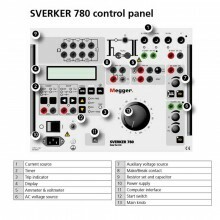 Modular design to permit optimal user configuration of output current vs. unit size. 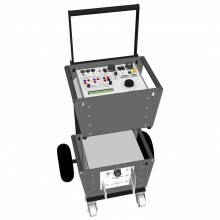 Compact transport cart facilitates portability into switchgear rooms with limited space. 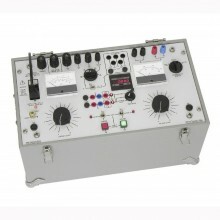 Mains voltage: 240/400V AC, 50/60 Hz. 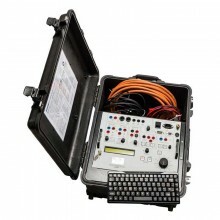 Application Field The instrument is intended for use in high-voltage substations and industrial environments. Operating temperature 0°C to +50°C (+32°F to +122°F). Storage & transport -25°C to +55°C (-13°F to +127°F). Inaccuracy 1% of range ±1 digit. 0 – 960 A / 0 – 3 kA. Ranges 0 – 2.000 A / 0 – 20.00 A. Maximum current 20 A (The input is not protected by a fuse). 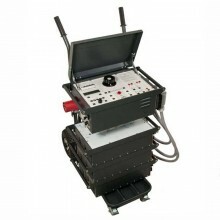 Presentation In seconds, mains frequency cycles or hours and minutes. 0.001 s – 99 h 59 min. For the stop condition in INT-mode 1 ms shall be added to the specified measurement error. Max. 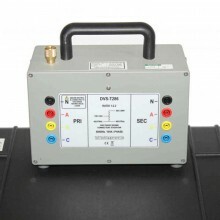 input voltage 250 V AC / 275 V DC. 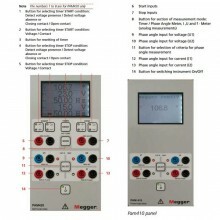 Inaccuracy ±2º (for voltage and current readings that are higher than 10% of the selected range). Z, P, R, X, S, Q and power factor (cos φ) For these measurements the result is calculated using U, I and sometimes φ.
Imax Stores highest current value that exists ≥100 ms.
INT-level Threshold indicating that current is interrupted, can be set to 0.7 or 2.1% of range for Ammeter 1. 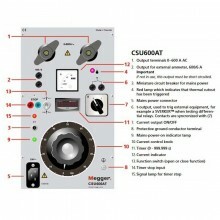 Hz 480 V AC / 60 Hz. Mains inlet IEC 60309-2, 63 A. Input current Output current x open circuit voltage / input voltage. Protection The output transformer has a built-in thermal cut-out, and the primary side is protected by a miniature circuit breaker. 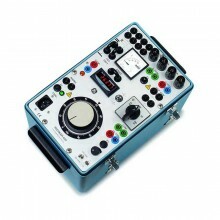 Control unit AT 570 x 310 x 230 mm (22.4” x 12.2” x 9”). Current unit S, X H 570 x 310 x 155 mm (22.4” x 12.2” x 6”). Complete with cart 690 x 350 x 860 mm (27.2” x 13.8” x 33.9”). 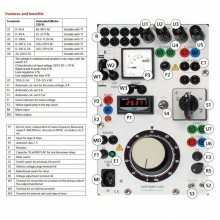 Control unit AT 25 kg (55 lbs). Current unit S 42 kg (92.6 lbs). Current unit X 45 kg (99.3 lbs). Current unit H 49 kg (108 lbs). Cart 11 kg (24.3 lbs). Available languages English, German, French, Spanish, Swedish. 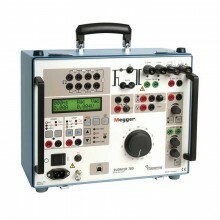 Megger Oden AT/1H warranty One-year. 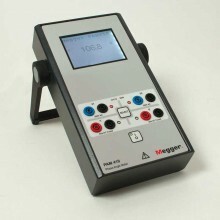 PDF Specifications of the Megger ODEN AT Primary Current Injection Test System. Mains Adapter Mains Adapter 240/400V.